HOTROD New-Age HeAvy MetAl Automotive sheet metal fabrication for the 21st century—or is it? 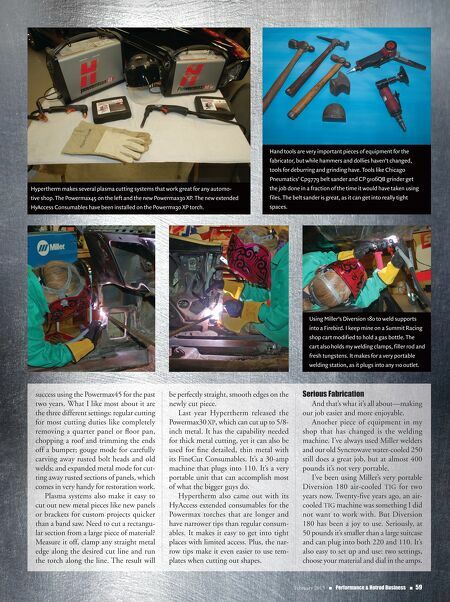 By JoAnn Bortles 58 n Performance & Hotrod Business n February 2015 I remember standing in a dark, cold, cluttered shop two years ago looking at a car project with unlimited potential. It was one of those projects that gets a gear- head's heart beating fast. There was just one problem: the fabricator. He was a young guy who wanted to do things the way they were done back in the 1950s and '60s—the days of "real hot rodding," he said. Fun with Electrons I smiled but inside I was cringing. Anyone who was doing sheet metal fabrication and restoration back then knew just how restricted the techniques were, due to the limitations of some of the equipment. Plus, automo- tive sheet metal back in the '50s was completely differ- ent from sheet metal of the '60s and later. Equipment needed to change with the material. There are some pieces of automotive fabrication equipment that are timeless and if properly taken care of, are actually as good or better that most of what is currently available new. Bending brakes, shears, English wheels, planishing hammers, bead rollers, shrinkers, Bridgeport milling machines and Logan lathes are examples of older equipment that perform as well as newer equipment. But when it comes to equipment with electrical cir- cuitry, there is no equal for equipment with the latest technology. And I have some experience in this area. 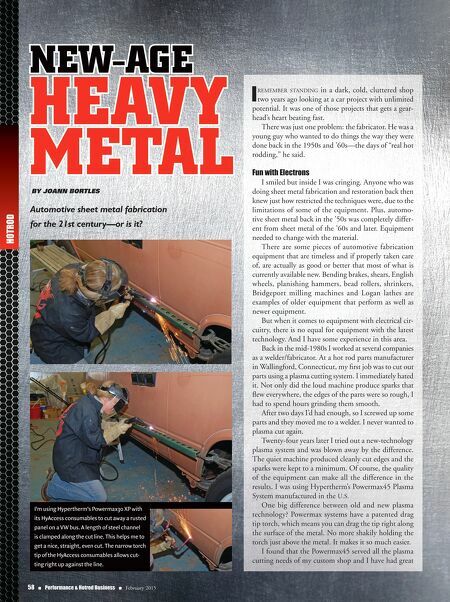 Back in the mid-1980s I worked at several companies as a welder/fabricator. At a hot rod parts manufacturer in Wallingford, Connecticut, my first job was to cut out parts using a plasma cutting system. I immediately hated it. Not only did the loud machine produce sparks that flew everywhere, the edges of the parts were so rough, I had to spend hours grinding them smooth. After two days I'd had enough, so I screwed up some parts and they moved me to a welder. I never wanted to plasma cut again. Twenty-four years later I tried out a new-technology plasma system and was blown away by the difference. The quiet machine produced cleanly cut edges and the sparks were kept to a minimum. Of course, the quality of the equipment can make all the difference in the results. I was using Hypertherm's Powermax45 Plasma System manufactured in the U.S. One big difference between old and new plasma technology? Powermax systems have a patented drag tip torch, which means you can drag the tip right along the surface of the metal. No more shakily holding the torch just above the metal. It makes it so much easier. I found that the Powermax45 served all the plasma cutting needs of my custom shop and I have had great I'm using Hypertherm's Powermax30 XP with its HyAccess consumables to cut away a rusted panel on a VW bus. A length of steel channel is clamped along the cut line. This helps me to get a nice, straight, even cut. The narrow torch tip of the HyAccess consumables allows cut- ting right up against the line.